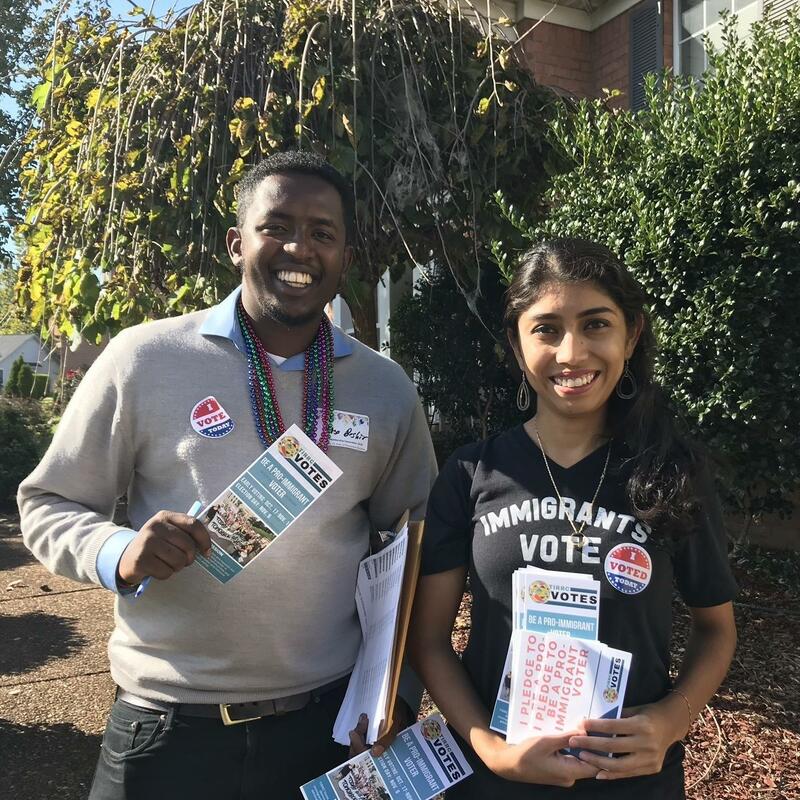 Volunteers Kayo Beshir, left, and Jazmin Ramirez, right, knock on doors in Antioch, Tenn., in an effort to get pro-immigrant voters to the polls. Early voting has already started in Tennessee, and turnout is high. There's a steady stream of voters at the county courthouse in Shelbyville, a small town about an hour south of Nashville that's seen a big influx of immigrants. And many voters here say illegal immigration is one of their biggest concerns. "There have been people who have been hurt and killed because of illegal immigrants that have come into this country," said voter Dottie Mershon. Other voters told me they're worried that immigrants are taking benefits and jobs away from U.S. citizens. "Our people are wanting jobs. Our citizens want jobs. And they're going to others," said Beth Campbell, the National Committeewoman for the Tennessee Republican Party. Tennessee has one of the fastest-growing immigrant populations in the country and immigration has become wedge issue in the closely watched race for an open senate seat here. "Bredesen lured illegal immigrants hundreds of miles," the narrator says, "by offering them driver's certificates." In fact, the state issued driver's certificates to undocumented immigrants years ago. Bredesen ended the practice after he took office. In recent years, Tennessee has passed some of the toughest anti-immigrant laws in the country. At a debate in Knoxville earlier this month, Bredesen insisted he's a border hawk — even if he doesn't agree with President Trump. "I believe very strongly in controlling our borders," Bredesen said. "But I think there are much better ways of doing it than building a wall. I think the wall is just sort of political theater." But Marsha Blackburn clearly sides with Trump. "Let me tell you something: Tennesseans want to see that wall built. Because open border policies have made every town a border state. And every state a border state," she said. These are not new positions for Blackburn. She's been a longtime immigration hawk representing Tennessee in the house. Her critics say Blackburn and Trump are trying to exploit fears about immigrants, who are no more more likely to commit crimes than anyone else. "Certainly, we think candidates like Trump saw what worked here in Tennessee, that you can make people think immigration is something to be feared, and you can win," said Stephanie Teatro, co-director of the Tennessee Immigrant & Refugee Rights Coalition, or TIRRC. Teatro thinks voters need to know that immigrants have helped to fuel Tennessee's economic growth. So her organization created a spin-off group called "TIRRC Votes" to train volunteers from across the state on how to get out of the vote. Many of those volunteers are recent immigrants, and can't vote. But Teatro says they're trying to mobilize allies who think President Trump's immigration crackdown is too harsh. She says they've turned out by the thousands to protest in the last two years. "We're reminding them, if you were angry about family separations, if you came out and marched with us when Trump signed the Muslim ban, we need you to stand with us again," Teatro said. Several hundred volunteers gathered last weekend outside of Nashville. After the training session, volunteers fanned out across the city and its suburbs. Kayo Beshir found himself knocking on doors in Antioch, Tenn., a diverse, working-class neighborhood in southeastern Nashville. Beshir was born in Ethiopia, and joined his father in Tennessee when he was 13. They're both citizens now. But Beshir says he still has to explain the importance of voting to his father. "Many of us come from countries where human rights are not respected," Beshir said. "So votes don't matter. And very rigged elections. So too many of our parents don't understand the purpose of it." But Beshir thinks his own generation doesn't need any encouragement to the polls. They get it. "That's why I feel hopeful is that our generation, our younger generation are gonna understand that," he said. "And be the voice for our parents. And be the voice for the community that is being attacked." Beshir hopes the immigrant community can make the difference in a tight election. If not this year, maybe next time. The caravan of migrants making its way across Mexico could have political implications far from the southwest border. With the midterm election less than two weeks away, Republican candidates are joining President Trump in talking tough about illegal immigration. NPR's Joel Rose traveled to Tennessee where one competitive race could help determine control of the Senate. JOEL ROSE, BYLINE: Early voting has started here, and turnout is high. At the county courthouse in Shelbyville, a small town in middle Tennessee, I asked a steady stream of voters what's driving them to the polls. JAMES HARRELL: I think the situation at the border - we see the large caravan of individuals coming up. I think it's one of my deepest concerns. ROSE: The caravan of migrants is thousands of miles away, but for many voters like James Harrell, it's top of mind. HARRELL: We have no idea who these people are, what countries they're coming from. ROSE: Shelbyville has seen a big influx of immigrants in the last 20 years. And voters like Dottie Mershon told me they're worried about crime. DOTTIE MERSHON: Because there have been people who had been hurt and killed because of illegal immigrants that have come into this country. ROSE: Other voters are worried that immigrants are taking benefits and jobs away from U.S. citizens. Beth Campbell is the Republican National Committeewoman for Tennessee. BETH CAMPBELL: All of a sudden, you've got this huge number of illegals, and our people are wanting jobs. Our citizens want jobs. And so they're going to others. ROSE: Tennessee has one of the fastest growing immigrant populations in the country. Now immigration is a wedge issue in a closely watched race for an open Senate seat here. Republican Senate candidate Marsha Blackburn is airing TV ads attacking her Democratic opponent, Phil Bredesen, the former governor of Tennessee. UNIDENTIFIED ACTOR: (As character) Bredesen lured illegal immigrants hundreds of miles by offering them driver's certificates. ROSE: In fact, the state issued driver's certificates to undocumented immigrants years ago. Bredesen ended the practice after he took office. And in recent years, Tennessee has passed some of the toughest anti-immigrant laws in the country. At a recent debate in Knoxville, Bredesen said he's a border hawk, even if he doesn't agree with President Trump. PHIL BREDESEN: I believe very strongly in controlling our borders, but I think there are much better ways of doing it than building a wall. And I just think the wall is sort of political theater. ROSE: But Marsha Blackburn clearly sides with the president. MARSHA BLACKBURN: Well, let me tell you something. Tennesseans want to see that wall built because open border policies have made every town a border town and every state a border state. ROSE: Blackburn has been a longtime immigration hawk, representing Tennessee in the House. Her critics say Blackburn and Trump are trying to exploit fears about immigrants who are no more likely to commit crimes than anyone else. STEPHANIE TEATRO: Certainly, we think candidates like Trump saw what worked here in Tennessee, that you can make people think immigration is something to be feared and you can win. ROSE: Stephanie Teatro is the co-director of the Tennessee Immigrant & Refugee Rights Coalition. She thinks voters need to know that immigrants have helped to fuel Tennessee's economic growth. So her group is training volunteers from across the state on how to get out the vote. UNIDENTIFIED PERSON #1: So for every house that you go and knock on, for every person that you talk to, we need you to mark down what happened. ROSE: Several hundred volunteers gathered last weekend outside of Nashville. Many of them are recent immigrants and can't vote. But Teatro says they're trying to mobilize allies who think President Trump's immigration crackdown is too harsh. She says they've turned out by the thousands to protest in the last two years. TEATRO: We're reminding them if you were angry about family separations, if you came out and marched with us when Trump signed the Muslim ban, we need you to stand with us again. So don't sit this one out. UNIDENTIFIED PERSON #2: Hey, good morning. KAYO BESHIR: Hey. Good morning, sister, how are you this morning? UNIDENTIFIED PERSON #3: Great, how are you? ROSE: Volunteers knock on doors in Antioch, Tenn., a diverse working-class neighborhood in southeastern Nashville. ROSE: Kayo Beshir was born in Ethiopia. He joined his father in Tennessee when he was 13. They're both citizens now, but Bashir says he still has to explain the importance of voting to his father. BESHIR: Many of us come from countries where human rights are not respected so votes don't matter and, you know, very rigged elections, so to many of our parents, they don't understand the purpose of it. ROSE: But Beshir thinks his own generation, the children of immigrants, they get it. BESHIR: That's why I feel hopeful is that our generation, our younger generations, are going to understand that and be the voice for our parents and be the voice for the community that is being attacked. ROSE: Beshir hopes the immigrant community can make the difference in a tight election - if not this year, maybe next time. Joel Rose, NPR News, Nashville. Transcript provided by NPR, Copyright NPR.